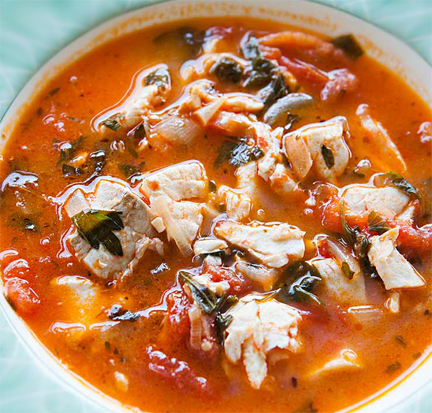 This stew works best with a firm white fish, such as halibut or cod. You could also use red snapper or tilapia. Stay away from delicate fish such as sole for this stew, or oily fish such as tuna. If you like, you can add shrimp, clams and/or scallops to the stew as well. I carmelize the onions before I add the tomatoes. Before adding the fish, I let the sauce simmer about 30 minutes to blend flavors. This stew has high flavor. 1. You’ll Carmelize the Onions for 20-30 minutes first, like this: Heat olive oil in a large thick-bottomed pot over medium-high heat. Add onion and sauté about 10 minutes. Turn heat to medium, cover and let onions continue to brown. Don’t stir too often but don’t let them burn. Keep turning the heat a little lower as needed. If too dry, add a little water to keep them moist. Add the brown sugar and vinegar in and simmer another 5 minutes. 2. Add the garlic, celery, parsley and the spices and cook 3-4 minutes. 3. Add tomatoes, tomato paste and fish sauce and gently cook for 30 minutes. 4. Add clam juice and dry white wine and simmer another 10 minutes. 5. Add fish. Bring to a simmer and simmer until the fish is cooked through and easily flakes apart, about 3 to 5 minutes. Add salt and hot sauce to taste. I also sometimes add roasted carrots and potatoes to it. This entry was posted in Uncategorized on May 15, 2016 by goddess.